Your Chance to Win Free Golf each Month! GOLF COURSE IS CURRENTLY CLOSED FOR THE OFF-SEASON! What's Going On at PGC? Peninsula Golf Course Tee Times Available Online! Book your tee time reservations online today! Peninsula Golf Courses: 18 hole & 6 hole / Par 3 Short Course are very popular golf courses in Door County. Don't wait too long! Book your favorite tee time times for this season. Multiple tee times can be made all season long! Click banner below for more info! Door County Wisconsin's Hidden Gems! Peninsula State Park Golf Course began as a 6 Hole course in 1917, grew to 9 Holes in 1923, and expanded to an 18 Hole course in 1931. 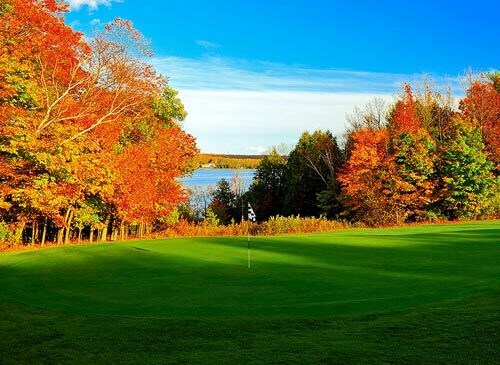 The course offers spectacular views of Eagle Harbor and the Village of Ephraim as you meander through the beautifully sculpted holes and scenic landscape. PGC course, with its well-maintained, watered fairways, is set in the majestic forests of white cedar, oak, beech and maple trees. Glimpses of the Niagara Escarpment can also be seen as the golfer traverses the course. The State Park's birds and wildlife are frequent visitors to the course and its tranquil setting. We invite you to enjoy the perfect 4 Star Round of golf as graciously given to Peninsula State Park Golf Course by Golf Digest and their readers. In 2015 we opened our award winning Short Course 6 Hole / Par 3, designed for golfers of all ages and abilities. The Short Course 6 holes range from 60-120 yards / natural grass tees / fairways and greens / rolling approaches / sand bunkers / tree lined perimeter. Additional amenties offered at Peninsula Golf Course: Driving Range, ProShop, Golf Lessons, Clubhouse Restuarant, On Course Food & Beverage Cart & 10th Tee Halfway House! Professional Golf Instruction Lessons given by appointment. Fees determined with PGA Certified instructor. Signup required. Purchase our gift cards online today! Also available are gorgeous course photos from the Paul Hundley photo collection. 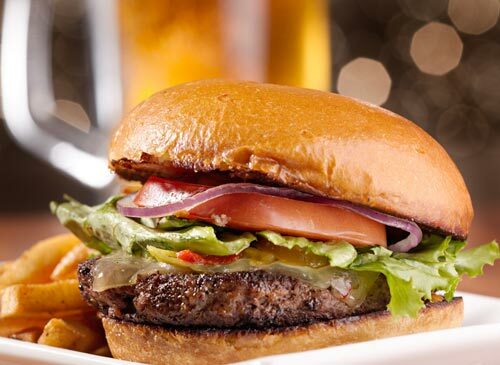 American Fare burgers, sandwiches & soups are our trademarks. A variety of snacks, fruit, and beverages including beer & wine. The Perfect Golf Course Venue. Our staff is committed to making your Outing or Tournament an overwhelming success. We host multiple golf outings each year, and on-site amenities & services include a restaurant, driving range, large putting green, cart & club rentals, and professional golf lessons. Contact us for pricing and to learn more today. Pick up a Gift Card or one of our Paul Hundley Photo Collection Prints to memorialize your round at Peninsula State Park Golf Course.